To Rumple’s shop where Belle finally question’s Killian’s identity (and is duly and deservedly snarked at for being so late in doing so) and Killian and Will do their fun back and forth. They need something that can make things bigger or smaller – of course Will, from all his time in Wonderland, has just what they need. Having used magic mushrooms, Killian gives Ursula her singing voice back – but it doesn’t work. Ursula puts it down to villains not getting their happy endings. She refuses to go forward with their deal and Killian attacks her – and ends up dumped in the sea, unconscious, to be rescued by apassing Ariel. It seems Ariel was trapped in the bottle with the Jolly Roger after an attempt to curse the Jolly Roger went wrong. Alas worse things are approaching – the Charmings! Who are being soppy and trying to foreshadow Emma turning to the dark side very very badly. They rescue August since the villains only left a conveniently smackable Cruella behind (though Cruella is right, the scruff is nicer than the timber). Alas this is when Ursula comes in and takes Mary Margaret hostage with her tentacles. 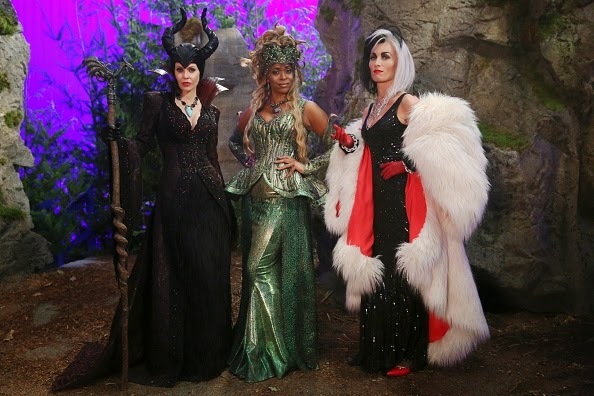 But Killian arrives, inspired by Ariel (the reasons why villains never get their happy endings is because they go about it the wrong way), he has sought out how to return Ursula’s voice – but having the one whose enchantment stole it return it. Her father who Ariel brought back via portal (she clearly has Sea King GPS). He apologises to her and returns her voice and she and her father reconcile. While everything is getting mushy, Cruella escapes. Everyone leaves except Killian and Emma because Killian is angsting about how close he came to going dark side. And Killian has realised all this talk of villains not getting their happy endings doesn’t just apply to the bad guys and Regina – it applies to him as well – losing his happy ending with Emma. Before she goes Ursula goes through with the deal and reveals the full plan – because Emma is the Saviour, the Author cannot give the villains their happy ending without her. Rumple plans to turn her dark side. Emma and Regina talk about a dream Regina have about her reconciling with Robin – and Evil Her appearing to protect her. She asks Emma to use her tracking skills to get some way to contact Robin. And August reveals that the door on the page Henry has is the door behind which the Author is trapped – he’s trapped in the book. I also love the shout outs to the past season – the writers recognise they have 4 seasons of history and they’re willing to draw on that; from Will Scarlett having Neverland goodies, to Squid Ink, to the Dragon to the Jolly Roger’s history with Ariel – the show isn’t pretending the past didn’t happen.